Today, as I met another lovely family looking for support to develop their child’s expressive language, I fought back my frustration. Why is more not being done to enable young people to express themselves? Support in schools seems to focus on “message in” strategies; putting in place visuals to help children understand what is expected of them, to follow routines and to help them comply with our demands. This is valuable of course but must be balanced with supporting the development of the child’s voice. By voice I mean enabling a child to talk about the things that are important to them, and to do this in whatever means is appropriate to that child. This is where AAC (Augmentative and Alternative Communication) comes in of course. I reflected this evening on my interactions with my typically developing nearly 3 year old. He has so much to say, about so many different things. He has a life all of his own; at nursery, at Grandparents and when playing on his own while I make dinner. He wants to share the important bits with me. He wants to share that he ate apple for snack this morning at Nursery or that his cousin pushed him when at Grandads this afternoon. He wants to talk about his choo choo trains and that he’s feeling sad about his sore knee. Many of the children I am supporting struggle to communicate beyond having a basic need met. Requesting a drink because you’re thirsty or asking for a crayon because you want to draw is only one function of communication. Communication is so much more. Twice this week, parents have stated the desire to engage with their children about their day, about what interests them, to simple be together and chat. Twice this week I have spoken about PODD as a means of developing the potential for this communicative connection to occur. There are a wealth of AAC options available, an overwhelming number of strategies which can be trialed and a long term commitment to learning about an individuals communication needs. This can be a daunting and often overwhelming proposition for a family (and at times the SLT! ) but the key message is that everyone has a fundamental right to communicate. We, at Grow would like to formally Adopt the Communication Bill of Rights and embed it into our key values. 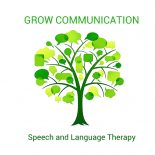 Katy Bennet is a specialist speech and language therapist and director at Grow Communication. Grow Communication is a Social Enterprise, based in Scotland, with an international client base. At Grow we are passionate about unlocking potential. Www.growsalt.uk, @growsalt. This entry was posted on February 23, 2018 by katygrow in Uncategorized.